Thousands of Microsoft developers have descended on the corporation's Redmond HQ. The delegates are there for the Microsoft Research two day annual TechFest, where several of the new technologies being demonstrated are next-generation search tools. The event is an opportunity to exchange ideas, enabling different divisions to compare new technologies and work out how they might work better together. Past products of collaborative efforts include Windows Live Labs and Microsoft adCenter Incubation Lab, which tests new advertising technologies. 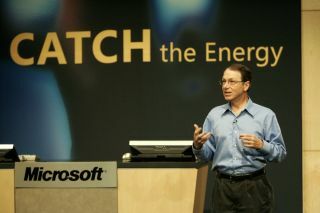 Microsoft says it will be taking the wraps off more than 100 innovations over the coming days. "TechFest is one-stop shopping to see and experience the breadth of software innovations we're pursuing," says Microsoft Research's Rick Rashid. "The innovations will allow people to explore their interests more deeply and share the things they care about more easily." So far several key developments have been unveiled, especially in the area of search. These include Mix: a search-based authoring application which enables you to build and share media at home or work - perhaps for sharing with relatives. Mix can search websites, or your hard drive, and will collate all the data it finds into a single document or disc. "Think of Mix as a kind of high-tech, living scrapbook," Rashid explains. "You can create a page that has digital pictures of your family, emails you exchange with family members...all without having to build a web page." Other applications , such as World-Wide Telescope, which enables people to peer deep into space on their PCs - are more educational. "What we've done is give people the ability to become digital astronauts," enthuses Rashid. "You can explore deep space from the comfort of your living room." This is, however, classified as a search tool, since you can find exactly what you want from the night sky in seconds. Rasid compares it to a space version of MSN Virtual Earth.